Android 4.2.2 Verizon Galaxy Nexus Update Imminent? 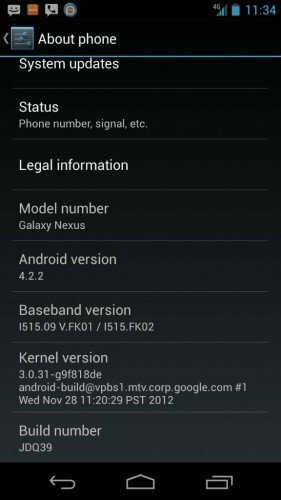 The Verizon Galaxy Nexus still hasn't been updated to the latest version of Android – Android 4.2.2 — but that could change very soon if codes which have shown up on Google's Developer site are any indication. The binaries for the Verizon update are already up on the site for testers so a nationwide OTA update might not be too far off. We've written extensively about Android 4.2.2's features here. It's debatable whether or not Verizon will be sending the update immediately, though, given the fact that they may want to wait until all the bugs have been fixed before sending it to the masses. An unofficial update could come our way, but it will probably take a while. Do you own a Galaxy Nexus from Verizon and have been anxiously awaiting the newest Android update? Or are you unimpressed by the number of features and waiting for Google to release something more substantial before you get excited? Let us know below! how to feel use 4.2.2? Don't worry. you are not the last one. The Fujitsu tablet M532 is still not updated. I'm really tired of Verizon being the last to update their phones. I buy the newest phone (at the time) and it doesn't get updated or takes forever. Between that and the price changes for their plans, I'll be leaving big red when my contact is up.